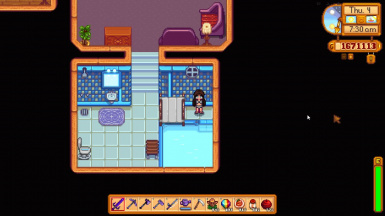 This mod adds a bathroom in your house once you upgraded it to level 2. 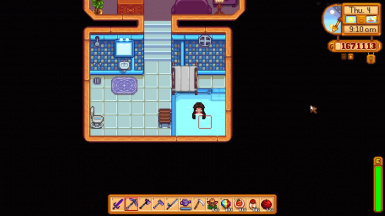 You can bath in your own little pool and recover stamina. Everything else is just cosmetic. Sprites are taken from the original Stardew Valley game. 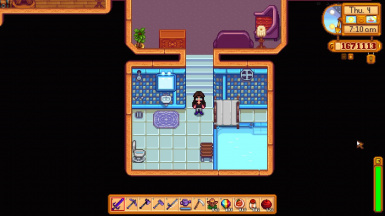 This mod adds a bathroom in your house once you upgraded it to level 2. You can bath in your own little pool and recover stamina. Everything else is just cosmetic. Unzip the zip and add the files/folders into your Content folder. because it will overwritte any other mods that uses the mapfile of the level 2 farmhouse. sadly I can not change this, since it seems that the dialog is hardcoded. http://www.nexusmods.com/stardewvalley/mods/369/ Note: You will have to install my mod first and then update to the kidfree version.